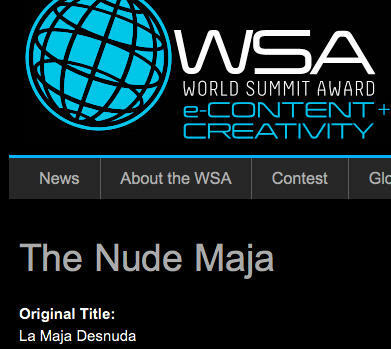 The World Summit Award, category "e-content + creativity" in 2011 went to La Maja Desnuda (Venezuela). Congratulations! "La Maja Desnuda is an ongoing website housing a multimedia archive for poetry, with biographies, images and especially, voices of poets narrating their work. The growing collection concentrates on Venezuela and Latin America, but includes numerous other international artists. La Maja Desnuda has a database with more than 900 poets recorded reading their poetry, among them contemporary poets as well known as Adonis (Lebanon), Fina Marruz Garcia (Cuba), Blanca Varela (Peru), Ledo Ivo (Brazil), Casimiro de Brito (Portugal), Nidaa Khoury (Lebanon), Ide Hintze (Austria) and Luisa Castro (Spain). The portal is complemented by a radio program on poetry, also called La Maja Desnuda, which has been on the air for more than 22 years and currently broadcasts in Venezuela. More than 1144 programs were produced during this time, presenting the most representative voices in world poetry, including: Walt Whitman, Tomas Tranströmer, Adonis, Pär Lagerkvist, Jorge Borges, César Vallejo, Miguel Hernandez, Sophia de Mello, T.S. Eliot and Pier Paolo Pasolini."